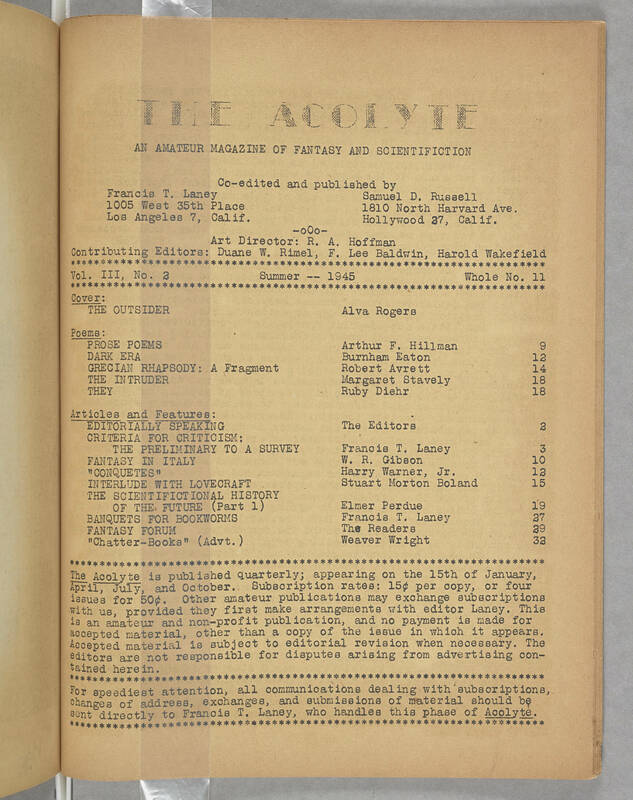 THE ACOLYTE AN AMATEUR MAGAZINE OF FANTASY AND SCIENTIFICTION Co-edited and published by Francis T. Laney 1005 West 35th Place Los Angeles 7, Calif. Samuel D. Russell 1810 North Harvard Ave. Hollywood 27, Calif -o0o- Art Director: R. A. Hoffman Contributing Editors: Duane W. Rimel, F. Lee Baldwin, Harold Wakefield Vol. III, No. 2 Summer -- 1945 Whole No. 11 Cover: THE OUTSIDER Alva Rogers Poems: PROSE POEMS Arthur F. Hillman 9 DARK ERA Burnham Eaton 12 GRECIAN RHAPSODY: A Fragment Robert Avrett 14 THE INTRUDER Margaret Stavely 18 THEY Ruby Diehr 18 Articles and Features: EDITORIALLY SPEAKING The Editors 2 CRITERIA FOR CRITICISM: THE PRELIMINARY TO A SURVEY Francis T. Laney 3 FANTASY IN ITALY W. R. Gibson 10 "CONQUETES" Harry Warner, Jr. 12 INTERLUDE WITH LOVECRAFT Stuart Morton Boland 15 THE SCIENTIFICTIONAL HISTORY OF THE FUTURE (Part 1) Elmer Perdue 19 BANQUETS FOR BOOKWORMS The Readers 29 "Chatter-Books' (Advt.) Weaver Wright 32 The Acolyte is published quarterly; appearing on the 15th of January, April, July, and October. Subscription rates: 15[[cent symbol]] per copy, or four issues for 50[[cent symbol]]. Other amateur publications may exchange subscriptions with us, provided they first make arrangements with editor Laney. This is an amateur and non-profit publication, and no payment is made for accepted material, other than a copy of the issue in which it appears. Accepted material is subject to editorial revision when necessary. The editors are not responsible for disputes arising from advertising contained herein. For speediest attention, all communications dealing with subscriptions, changes of address, exchanges, and submissions of material should be sent directly to Francis T. Laney, who handles this phase of Acolyte.